Perusing social media at work typically involves looking for project opportunities, discovering the latest industry trends and making business connections along the way. It rarely opens nostalgic baseball rabbit holes to meander through. But earlier this week, that happened. Recently, a colleague from the railroad industry discovered more than 500 photographs from his company's archives. These images are primarily from the 1950s and 1960s and feature old Chicago Transit Authority (CTA) buses, rail vehicles, stations and general infrastructure. 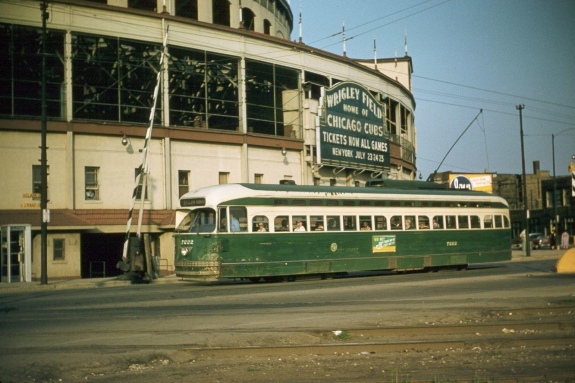 While all of the pictures are amazing and capture a bygone era, but one image caught my attention -- a streetcar passing Wrigley Field at the corner of Clark and Addison near the iconic marquee with its original color scheme. In the past, I mentioned that I enjoy finding undated baseball photos (like here and there) and discovering some nugget of information to determine an exact date. Geeky, I know. While this is not a photo from a game, we can certainly determine a date range. After examining the ad on the side of the streetcar, it's not clear, but it does say 1957. The photographer captured this image at some point during the Chicago Cubs' 17-game road trip in July. 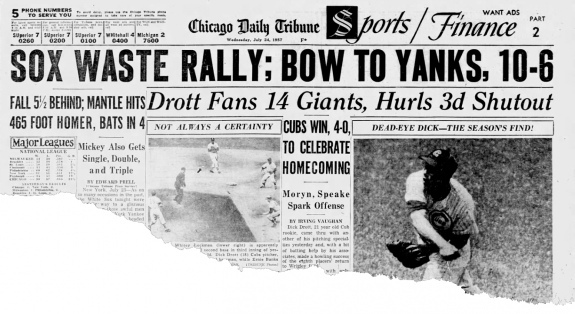 After splitting a Fourth of July doubleheader against the St. Louis Cardinals, the Cubs departed Wrigley Field to play the Milwaukee Braves, Philadelphia Phillies, New York Giants, Pittsburgh Pirates and Brooklyn Dodgers. While on that road trip, the Cubs compiled a 5-12 record and managed a 3-game losing streak and two 4-game losing streaks. 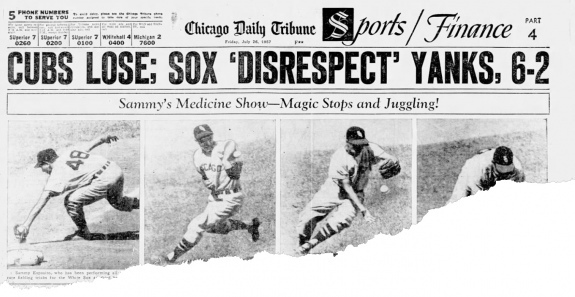 During 1957, the Cubs did not play inspired baseball. A youthful Ernie Banks was on the cusp of winning his first of two consecutive National League Most Valuable Players awards (1958-1959). At best, the Cubs would reach third place in an 8-team Senior Circuit, but that was during the first week of the regular season. From April 28 through the end of the campaign, the Cubs lingered in the doldrums bouncing between seventh and eighth place. The North Siders would conclude the season tied with the Pirates (62-92, .403) in last place. They finished 33 games behind the eventual World Series-winning Milwaukee Braves. 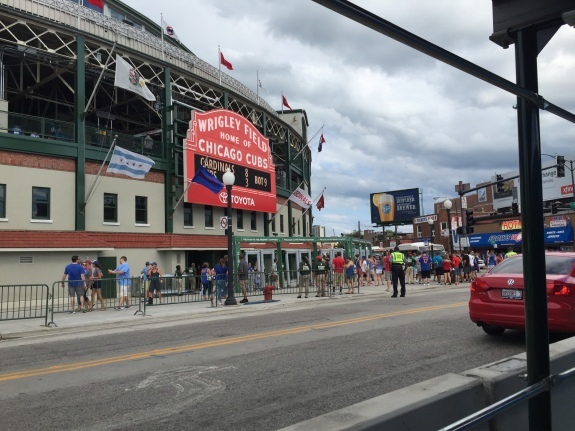 While the Cubs were away from the Friendly Confines, the team was pushing tickets for the upcoming 3-game series against the New York Giants. The Giants were three seasons removed from the franchise's last World Series title, and six seasons removed from Bobby Thomson's "Shot Heard 'Round the World." Following the late-July series, the Giants would only return to Wrigley Field once more (a doubleheader on September 15) before abandoning the famed Polo Grounds and relocating to San Francisco. So how did the Cubs fare during that series? The Cubs won the first two games, 4-0 and 2-1, respectively. The Giants salvaged the finale, 5-2. While fans today are accustomed to seeing Wrigley Field overflowing with fans, that wasn't the case during the Eisenhower administration. During the series against the Giants, the two teams played in front of 26,054 fans (July 23 9,589; July 24 8,908; July 25 7,557). Here are pages from the Chicago Tribune following each of the three games. I have myriad photos of Wrigley Field stashed away in my personal archives. After briefly glancing through said images, I found my most recent photo taken from the closest possible angle to the 1957 image. I snapped this photo after the Cardinals hammered the Cubs, 8-4, on Saturday, August 13, 2016. While the 1957 season didn't end on a happy note, the 2016 season certainly did.